So I’ve told you already that I broke the ice and started running for my journey from Couch to 42k with Heather. Well guess what happened after that first run? Probably mere hours after I told you about it. The. worst. muscle. cramps. ever. I’ve had muscle cramps before. I was an athlete in a former American high school life, and I remember the times when I’d be doing my laps in the pool and suddenly my foot would decide to try curling up into a ball. Then it was out of the pool, bottle of water in one hand, banana in the other, while the physio did things to your foot that felt worse than the cramp in the first place. I thought that was bad. So the day of my first run went great. I got up early, jogged around Clissold Park, got home, got ready and jumped on my bike to head to work. Left work and (this may have been the mistake) headed straight to my weekly netball game. I got home and everything was great. Had some dinner, watched some iPlayer, got ready for an early restful night. All nicely tucked up in bed, straighten my legs out. And it hits me. It starts at the toes. The arches of the foot. My calf, my shins, my….everything. My whole right leg was in one giant muscle spasm. This is a muscle cramp like I didn’t even know existed. Unfortunately in the middle of the night, home alone, with no idea how to just make it stop, I felt pretty helpless as I yelled at nobody in particular while trying my best to stand up on it. So at least five of those symptoms are pretty likely to fit my description pretty well. And the worst one? Dehydration. 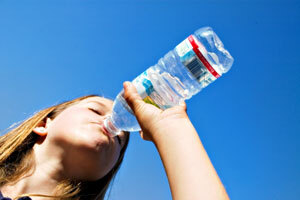 Think about how much water you drink in a day. I mean really think about. I always thought my agua levels were all good. But when I’m jogging a couple of miles, cycling about 8 miles, AND playing netball? I need a LOT more water in this body of mine to keep going. Anyway, lesson learned. Big time. Please don’t let my mistake be yours. Be all about the agua. אני מניח שאתה מתכוון לזה:J Appl Physiol. 1992 Nov;73(5):1986-95.Evaluation of protein reenirqmeuts for trained strength athletes.אם כך הדבר:1. במחקר בדקו “whole body protein synthesis (WBPS)” שזה לא שווה ל MPS (Muscle Protein Synthesis) ולכן אין להסיק מסקנה שאם ל WBPS לא הייתה השפעה אז גם לא תיהיה ל MPS, אלו שני דברים שונים.2. המחקר בוצע רק 13 ימים.3. במחקר המלא לא ציינו כמה סטים, חזרות ואימונים עשו המתמודדים.4. במחקר המלא אין איזכור לבקרה קלורית.